Our Fleur de Lis Tray Milky Way Soap Mold features the traditional fleur de lis symbol in sharp detail. Typically a symbol of royalty, the fleur de lis adds an air of class to any soap. 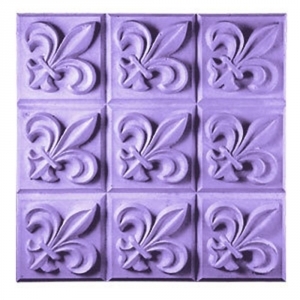 Soap Bar Dimensions: 2.25" x 2.25" x 1.3"
Notify me when Fleur de lis Tray Soap Mold is in stock.